Nurses at the University of Alabama at Birmingham are known for providing exceptional care and going above and beyond for their patients. 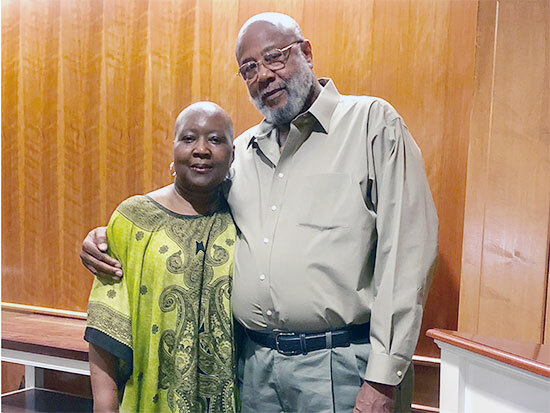 Brenda Peoples, a patient undergoing acute leukemia care in UAB’s Hematology/Oncology unit, experienced just how far her nurses were willing to go to bring her and her boyfriend a special moment of happiness that could impact them for a lifetime. In March of 2018, Peoples was diagnosed with acute leukemia, a type of blood and bone marrow cancer. With leukemia, the bone marrow produces too many white blood cells, which typically fight infections. The disease progresses rapidly and creates immature blood cells, crowding out other healthy blood cells that may collect in the blood, bone marrow and lymph tissue. Acute leukemia can be extremely draining on the person affected, causing fatigue, infections, persistent weakness, and aching bones and joints. Brenda Peoples and Lovie IvoryPeoples has been hospitalized for nearly two months since her diagnosis, and by her side each day of the journey has been her partner of 11 years, Lovie Ivory. Although Ivory asked Peoples to marry him many times throughout their relationship, Peoples never thought the time was right until a short time before her diagnosis. That’s when UAB’s nurses stepped in. Peoples’ nurses starting putting plans in motion for a celebration of love and life within a matter of hours, getting UAB Pastoral Care and UAB Music Therapy involved to round out the ceremony. In front of a few family members and nursing staff, Peoples and Ivory were brought into one of UAB Hospital’s chapels and exchanged words of love, affirmation and promise to each other. After the blessing was over, there was one more surprise for the happy couple as Peoples’ nurses showered the couple with balloons, a cake and sparkling grape juice to cap off the celebration. Peoples’ condition is improving day by day, and nurses hope she will be able to go home in the coming days. While Peoples and Ivory plan to legally wed once she is released from the hospital, UAB’s nursing staff knew what a blessing a celebration like this was and what joy it would bring to so many. “We are thrilled to do the best for our patients and provide care from our hearts, and it is an honor to be a part of their journey together,” Purdy said.